Welcome to Delos! 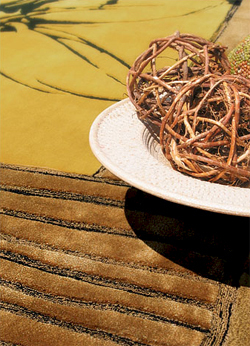 Our team is headed by Ivan and Leah Phillips, each a seasoned rug and carpet veteran. Delos was founded as a response to the rug market’s need for a more authentic and customer-centric rug buying experience: Communicate and provide the right product at the right price. So, they developed a pom set of 216 colors that would become the eventual foundation of Delos today. Over the years, Delos has developed tufted products with incredible design diversity and characteristics for the price point, and the use of five different yarn systems. More recently, Delos has built on their initial successes with the inclusion of Tibetan knotted collections with Spun Bamboo accents. Today, clients are able to use our patterns in either tufted or knotted constructions, and can reference an online module that allows full creative license. Today, Delos operates with the same foundational Customer First cornerstone, with representatives in every major market in the United States and Canada who want to educate both consumers and retailers. The Delos office team works tirelessly to ensure that your order is filled properly and promptly. We value our clients and the relationships we have been able to develop over time. Again, welcome! We invite you to explore Delos, our offerings, and how easy it is to design the carpet of your — or someone else’s — dreams.